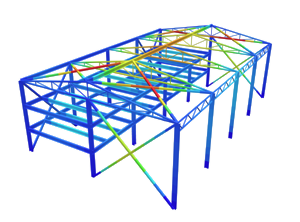 The Linear Static and Buckling Analysis is one of the analysis methods that SkyCiv offers to solve your structure. This analysis considers the buckling of members which is flexural instability due to axial compression, also known as Euler Buckling. The main result determined by the analysis is the buckling load factor. A factor of less than 1.0 indicates that the structure is buckling. 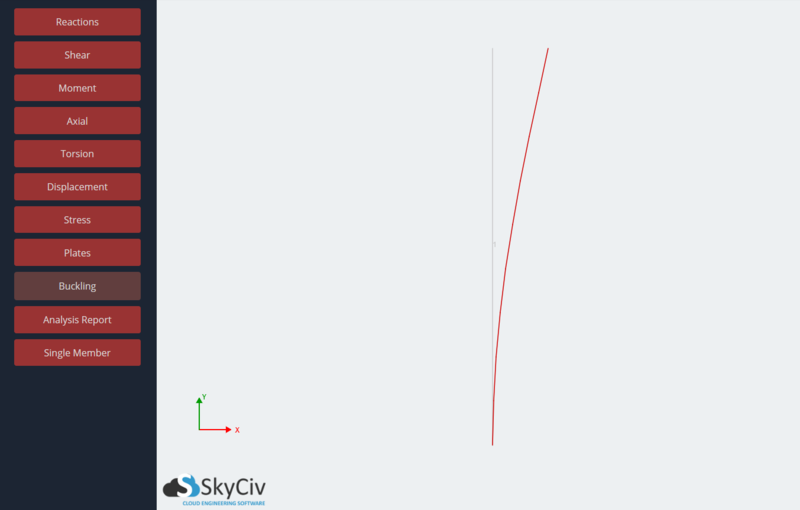 SkyCiv users often enquire about why the software only returns a single buckling factor, thinking that there should be a factor for each member. However, SkyCiv performs a rational elastic buckling analysis via an eigenvalue analysis, meaning that buckling is considered for the entire structure, groups of members and individual members. This analysis method is important because a linear static analysis alone is not enough to indicate failure due to buckling. In fact, if a structure is found to be buckling then the results of the static analysis are not correct or applicable. Performing this extra analysis will however increase the solve time. The critical load of each member is also determined during the analysis. This is the load at which a certain member will buckle. The critical load is proportional to the Young’s Modulus and Moment of Inertia, and inversly proportional to the length of the member. Critical load is not a function of Yield Strength. By default a simplified buckling shape is solved by the software when the structure is buckling, or close to buckling. If you’re interested in solving a more accurate buckling shape then please enable the “Accurate Buckling Shape” setting found in the Settings of the software. Please note that enabling this option will increase the solve time. This buckling analysis only considers Euler Buckling due to axial compression. Torsional buckling is not considered. If an extremely low buckling load factor is found by the software (i.e. less than 0.05) then this could be due to the model being unstable. Hence, you should look at the stability of the model as it could be the problem rather than buckling. Check your member-end fixities and supports. Often excessive deflections can be a hint that these instabilities exist too. This buckling analysis only applies to members, not plates. 1) Consider a vertical member that is 1 metre tall with a rectangular cross section that is 10mm by 50mm, made from Structural Steel. It is fully fixed at the base of the column and experiencing a 5 kN compressive point load. 2) To solve the structure with a linear static and buckling analysis, hover over ‘Solve’ and click ‘Linear Static + Buckling’. When the structure has finished solving, you’ll notice that a warning appears to indicate that the buckling load factor is less than 1, indicating that buckling is occuring and needs to be checked. 3) View the buckling results by clicking the ‘Buckling’ button on the left. The buckling shape of the structure is drawn and a pop up will appear to inform you of the buckling load factor. A load factor less than 1, as in this case, indicates that buckling is taking place. 4) More buckling result details can be viewed in the Analysis Report. 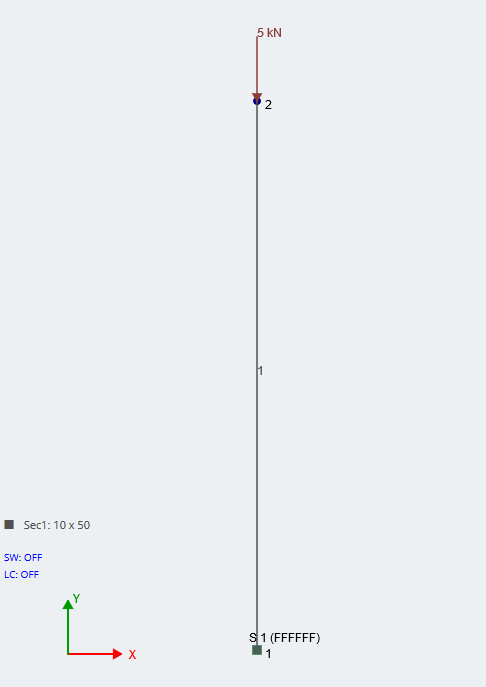 Click ‘Analysis Report’ in the set of results on the left and generate a report. Open the report and scroll to the Buckling section heading. Results are given for the critical load (the load at which buckling begins), actual length, and theoretical effective lengths in the z and y axes.